This book contains five small, versatile dungeon scenarios, or "mini-dungeons". Each one is a complete adventure, ideal for the Judge to pull out and use when there is not enough time to prepare one for the players. 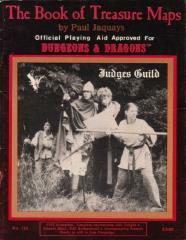 All are set in the Judges Guild City State campaign wilderness system, though they may be played separately. They include separate maps for players and Judge, full backgrounds and accompanying rumors, all thoroughly illustrated in the Jaquays tradition. The Lost Temple, The Tomb of Aethering the Damned, The Lone Tower, Willchidar's Well, and the Crypts of Arcadia awaits the stalwart players. Cover photograph depicts the author and several friends (Jaquays is the big guy in the tin hat).